Country music history has had plenty of significant events, interesting anecdotes, surprising factoids, and great music. 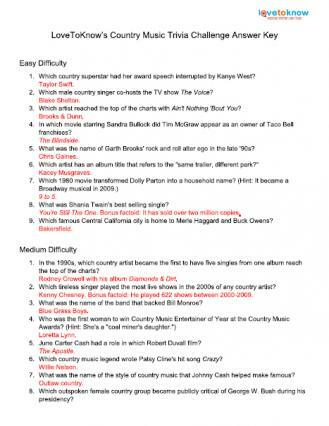 Trivia buffs and country fans will enjoy this collection of trivia questions that features 36 questions and answers, divided into three skill levels. The answers follow the list of questions, so don't scroll down too far if you're trying to test yourself without seeing them! These questions and the answer key can be printed out to use anywhere. If you need help downloading the printables, check out these helpful tips. Click to print trivia questions. Which country superstar had her award speech interrupted by Kanye West? Which male country singer co-hosts the TV show The Voice? Which artist reached the top of the charts with Ain't Nothing 'Bout You? In which movie, starring Sandra Bullock, did Tim McGraw appear as an owner of Taco Bell franchises? What was the name of Garth Brooks' rock and roll alter ego in the late '90s? Which artist has an album title that refers to the "same trailer, different park?" What was Shania Twain's best selling single? Which famous Central California city is home to Merle Haggard and Buck Owens? In the 1990s, which country artist became the first to have five singles from one album reach the top of the charts? Which tireless singer played the most live shows in the 2000s? What was the name of the band that backed Bill Monroe? Who was the first woman to win Country Music Entertainer of Year at the Country Music Awards (CMAs)? June Carter Cash had a role in which Robert Duvall film? Which country music legend wrote Patsy Cline's hit song Crazy? What was the name of the style of country music that Johnny Cash helped make famous? Which outspoken female country group became publicly critical of George W. Bush during his presidency? About whom did Taylor Swift write the song I Knew You Were Trouble? At the 1975 CMAs, what did Charlie Rich do with the card that announced John Denver as the Entertainer of the Year? Who won the first country Grammy? What is the name of the city that built the Shania Twain Centre in her honor? Who was Johnny Cash's first wife? Which major record label signed Randy Travis in 1985 after many others turned him down? 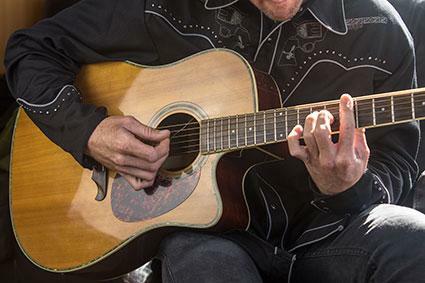 Who coined the term "country music?" From what kind of wood did they make the famous circle that is at the center of the Grand Ole Opry stage? Sara Carter of the Carter Family used a special kind of instrument in her performances. To what family of musical instruments does that instrument belong? Click to print trivia answers. You're Still The One. Bonus factoid: It has sold over two million copies. Rodney Crowell with his album Diamonds & Dirt. Kenny Chesney. Bonus factoid: He played 622 shows between 2000 and 2009. 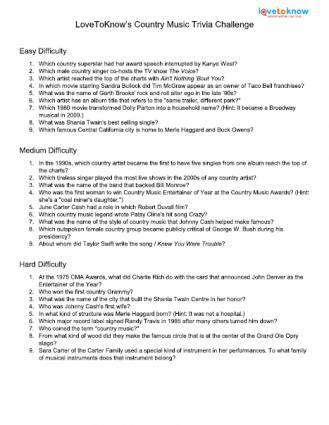 These trivia questions are a great way to break the ice and have a little fun at a CMA Award viewing party or a fun get together with friends. And, in case you found yourself arguing with the answer key, the links above provide the factual background for each answer as well as some bonus information about each topic.